With this much fiber and calcium, chia seeds provide more than a third of your daily fiber needs and nearly 20% of your daily calcium needs in a single serving. The 4 grams of hunger-quashing protein add to chia’s nutritional offerings. Our bodies do not make omega-3 fats, so we must get them from food. And having more omega-3s in the diet is linked with good health, and with lower risk of heart disease, stroke, and some types of cancer. This is where chia seeds come into the picture: more than half of the fat in chia seeds is alpha-linolenic acid, a beneficial, omega-3 fat. You’ll find chia seeds in the bulk section of your natural grocery store, and in the health food section of your regular supermarket. If you’re ready to give chia seeds a try, there’s no shortage of creative ways to work them into your diet. 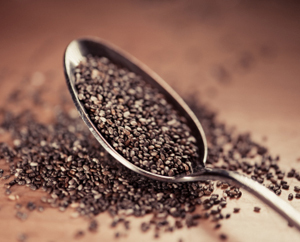 Chia seeds are tasteless, and slip into other foods and beverages easily without altering flavor. Get soaked. Place a large spoonful of chia seeds into a small glass and cover with water. Let stand for 20 minutes; they will form a gel. Add the chia seed-gel mixture to smoothies, yogurt, or oatmeal. It’s okay to soak seeds over night, so they will be ready for breakfast. Drink up. Toss a spoonful of chia seeds into your water bottle or add them to juice. You won’t taste them and they are so tiny you may not even notice them in the liquid. Cook. Add chia seeds to soups, stews, and casseroles, as a thickener. Bake. Process chia seeds in a coffee bean grinder and mix with flour, milk, eggs, mashed banana, and cinnamon to make pancakes. Add chia seeds to the batter or dough when making muffins, bread, or other baked goods. Surf for ideas. Perform a quick internet search of “chia seed recipes.” You will find hundreds of additional ideas, tips, recipes, and hints for incorporating chia seeds into your food and drinks. Call your doctor. If you have digestive health issues, such as diverticulitis or inflammatory bowel disease, do not add chia seeds without first talking to your healthcare provider. While these tiny seeds improve digestive health for many, they may not be right for people with existing digestive conditions.